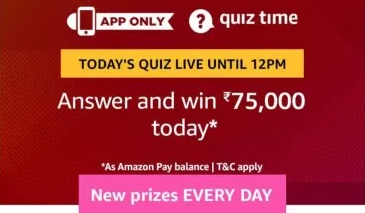 Amazon Pay Quiz Answers: Play & Win Rs 75000, Amazon has again come up with another quiz time. In this quiz time Amazon is offering Rs 75000 when you play this quiz. As always this quiz is also valid for today only. So download Amazon app now. Offer is applicable from 25th February 2019 8:00 Am to 25th February 2019 11:59 Pm.